Pictured above are Heather Hogue; Mavryck Zinzer; Clay and Rafe Hogue; Cathie Gregory; Bethani Zinzer; Kerrigan and Madeline Nunnelee; Sadee Hutcheson; Jonde, Jeff and Jayni Zinzer; New Albany Mayor Tim Kent; David and Diane Rasberry; Donald and DeeDee Files; Hawkyns Zinzer; Daniel, Jeremy and Jax Files; Brittani, Josh and Mace Hall; Toni, Anna and Drew Schroeder; and Olivia Robbins. About thirty family members and friends planted a tree at New Albany’s Sportsplex Thursday afternoon, August 13, to commemorate a life that was much too short. Jagger Zinzer, age 3-1/2 months, died Monday, December 1, 2014, a victim of Sudden Infant Death Syndrome (SIDS). He was born August 7, 2014, and would have been one year old last week. 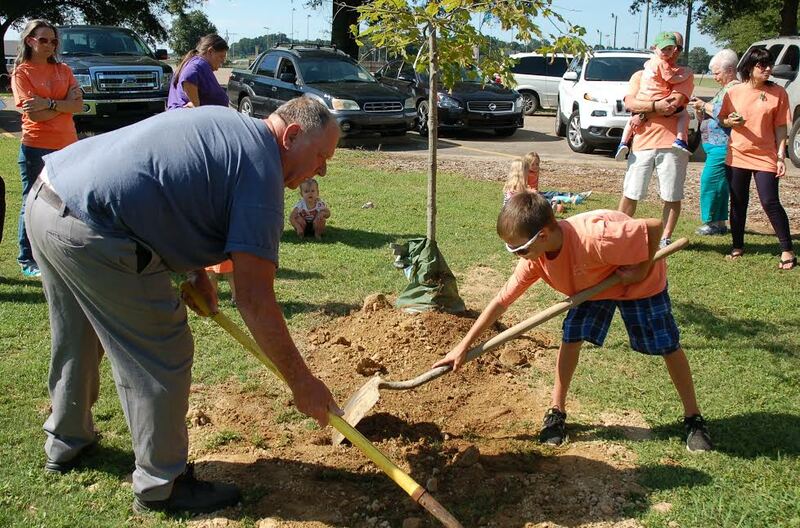 Jagger’s parents, Jonde and Jeff Zinzer, his siblings and his extended family — cousins, uncles, aunts, grandparents and great-grandparents — were joined Thursday by New Albany Mayor Tim Kent in planting a 15-16 foot oak tree as a living memorial. Many of those present wore matching orange T-shirts emblazoned with the words “Jagger’s Celebration of Life” and naming four organizations that will benefit from money that has been raised by his family. Thus far the Zinzers have raised about $6,000 that will be given to Donate Life, Gideons International, First Choice, and LeBoneur Children’s Hospital of Memphis. The Zinzers are also starting a Jagger Memorial Fund to be able to help local families that experience the loss of a child. The first fundraising event for the Jagger Memorial Fund will be at 11 a.m. on Saturday, August 29th, at the Movie Reel in New Albany. The tree planted Thursday is a Shumard oak (Quercus shumardii), about 15-16 feet tall, and was planted near the double-drive parkway into the Sportsplex. A member of the red oak genus, Shumard oaks typically grow to a height of more than 100 feet, develop trunks three feet or more in diameter, and at maturity may have a canopy 90 to 100 feet in diameter. Native to the south central and southeastern United States, Shumard oaks commonly live 500 years or longer. David Rasberry, maternal great-grandfather of Jagger Zinzer, and Hawkyns Zinzer, Jagger’s brother, finish planting of the red oak tree. The death of any baby is a heavy blow, bringing unspeakable grief to all those who love the child, and sadness even to those who do not know the child or his family. The Zinzers have dealt with a crushing tragedy by displaying exemplary humanity in raising the memorial fund and by planting a living creation which will likely survive us all by five centuries. The acorns of a Shumard oak are about an inch in diameter and may be produced for the coming 500 years by the tree planted as a memorial to Jagger Zinzer. Sudden infant death syndrome (SIDS) is the unexplained death, usually during sleep, of a seemingly healthy baby less than a year old. It is the leading cause of death among infants one month to one year of age, claiming about 2500 lives in the US each year. There is believed to be a link between SIDS and abnormalities of the portion of the brain that controls breathing and sleep awakening. SIDS deaths are higher in males and in African American babies; most SIDS deaths occur between ages 2-4 months, and incidents increase during the winter. To reduce the risk of SIDS, place infants under one year of age on their backs to sleep. (This one recommendation from the American Academy of Pediatrics has reduced SIDS deaths by 50%). Do not place pillows, bumper pads, soft plush toys, etc. in the crib. Do not expose the baby to second hand smoke. Keep the baby warm, but do not use excessive clothing or bed linens. What a wonderful story! Great job! So proud of the Zinzers and so thankful for them and our sweet mayor for thinking of this. I’m so blessed to have know the Zinzer’s for some time now and their sweet baby “Jagger.” This family has made a huge impact on so many people by the bravery and love through God’s grace and mercy they have shown to not only Union County but also to the world. I love them so much and can’t wait to see how this impact’s even more lives!